I've been meaning to write about this for some time, but kept getting sidetracked by other events. Last summer, I met the very interesting painter and "writer on art" Joe Fyfe. Unfortunately I was in the throes of completing my three years of learning Latin and preparing for and taking the day-long final examinations, as well as painting for a couple of shows and teaching. Thus, I didn't get more than one real meeting with him, visiting him at the studio where he was staying and having lunch in the restaurant surrounded by the Pipilotti Rist's "Kunst am Bau," a giant red outdoor lounge. I agree with what Joe said, that it is not a metaphor that really attracts me. It was gutsy of the city to pay for and install it (most Kunst am Bau is rather flaccid, decorative geometric nonsense or quasi-event neo-conceptual entertainment novelties). Nevertheless, it doesn't hold together well and is ageing quickly and poorly. Fyfe was doing a visiting artist/scholar residency at Felix Lehner's wonderful fine art casting foundry, a place I should hype more. St. Gallen, Switzerland is fortunate to have two of the world's best artisans-serving-fine art: Urban Stoob, a famous and remarkable stone lithographer about whom I'll write another time, and Felix Lehner. In the Sitter river valley, a small yet dramatic drop from the surrounding area, west of the city, an industrial (more formerly than now) area is located. Here, a former textile dyeing factory was converted by Lehner into a foundry. Within 10 years it had international renown. Over a dozen expert artisans assist artists in the production of sculptural works as well as occasionally restoring important historical bronzes. And generally of very large proportions. Felix Lehner, the founder and boss of the foundry is highly knowledgeable of contemporary art. 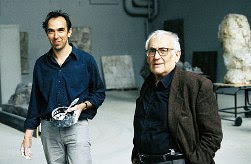 Furthermore, he is the initiator of the "Sitterwerk" a permanent conglomeration of a handful of buildings forming a private art center (link), including a monographic museum, Schaulager and library. One area is dedicated primarily to Hans Josephsohn, a unique sculptor who you should google. The Sitterwerk and Foundary's website in English is here. The site for the Josephsohn museum, situated in the former boilerhouse, hence called the Kesselhaus, is here. 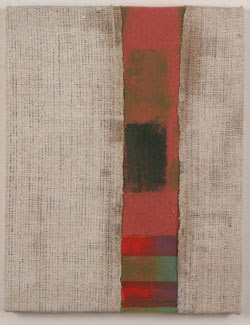 Fyfe, besides painting his own works, was there to research and rewrite an essay for Art in America on Hans Josephsohn. Fyfe had just returned from an extended stay in Southeast Asia, which he blogged about here. Joe is, in fact, a fine and inveterate blogger. You can check in on him here, where, under July 18th, he wrote about our meeting. Fyfe does some highly unique artworks wherein I see shades of Blinky Palermo cavorting with the soul of Matisse. Generally described, he stitches and glues found fabric together, abutting the elements rather than collaging them, and then applies very sparse strokes of paint. Very atmospheric, clear-sighted, elegant and historically aware. His writing is similar. Some bio minutiae: Fyfe was born in NYC in 1952, received his BFA from the University of the Arts in 1976. He has had recent solo shows of his paintings at JG Contemporary in New York City, and at Mai's Gallery in Ho Chi Minh City, Vietnam. He has been in recent shows at Tracy Williams Ltd. and Cheim and Read in NYC, Galerie Pitch in Paris and The Myers School of Art in Akron, Ohio. He has taught at Parsons, VCU, Temple and UT, Knoxville. He has received grants from The Pollock-Krasner and Gottlieb Foundations and he writes for Gay City News, Art in America, Arts AsiaPacific, Art on Paper and Artcritical.com. You can read articles by Fyfe at artcritical here. A fine interview with Joe and Merlin James titled "This Wonderful Exile of the Artist" was in Modern Painters (no kidding! A painter interviewed in Modern Painters!). It is available on the web here. A review of Fyfe's paintings by Stephen Maine, originally in Art in America, is available here. And while we are listing links, Fyfe is represented primarily by JG Contemporary, website here. I felt an immediate affinity with Joe, and a similarity of perception, strangely enough, as our individual aesthetics are superficially so different. I would have liked to talk longer and repeatedly with him. Well, another time!